Who was the first quarterback to win the Super Bowl four times? Who has the record for the most consecutive completions? Who has the record for most receiving yards in one season? If you know a young reader who can’t get enough of football, then you need to check out the newest offering from Sports Illustrated for Kids. 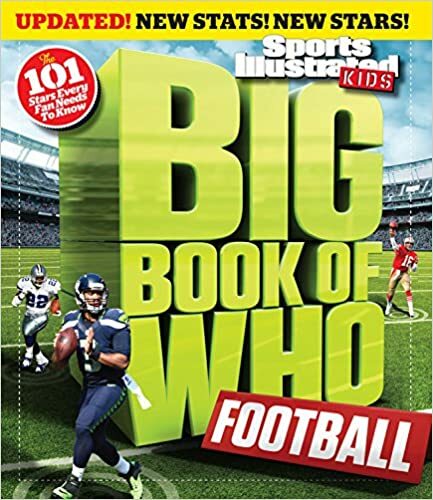 Sports Illustrated Kids Big Book of Who: Football asks, and answers, just about every question a young football fan might ask, in a fun, colorful, and informative way. This “Big Book” of football is divided into five easy to read chapters: Champions, Personalities, Record Breakers, Super Scorers, and Yardage Kings. At 125 pages (plus a few additional pages for a player index so readers can easily find their favorites), there is a lot to see. Chock full of photos of the best, most exciting players in the NFL, kids will start flipping through this book as soon as they see it, stopping to read facts about their favorite players. The book is set up as a series of questions – “Who …. ?” followed by a mini biography on that player, an interesting ‘Super Stat,’ and with some players an additional ‘Fast Fact’ or a fun ‘Did You Know?’ query. The text is boxed into a portion of each photo, off to the side so that readers can get a good look at each and every player. Photos are bright, crisp, action-packed and fill up each page. Quill says: Stuffed full of fun facts about their favorite players, Sports Illustrated Kids Big Book of Who: Football is a book that young football players will love.